Objectives To see if a group course delivered by rheumatology teams using cognitive-behavioural approaches, plus usual care, reduced RA fatigue impact more than usual care alone. Methods Multicentre, 2-year randomised controlled trial in RA adults (fatigue severity>6/10, no recent major medication changes). RAFT (Reducing Arthritis Fatigue: clinical Teams using CB approaches) comprises seven sessions, codelivered by pairs of trained rheumatology occupational therapists/nurses. Usual care was Arthritis Research UK fatigue booklet. Primary 26-week outcome fatigue impact (Bristol RA Fatigue Effect Numerical Rating Scale, BRAF-NRS 0–10). Intention-to-treat regression analysis adjusted for baseline scores and centre. Results 308/333 randomised patients completed 26 week data (156/175 RAFT, 152/158 Control). Mean baseline variables were similar. At 26 weeks, the adjusted difference between arms for fatigue impact change favoured RAFT (BRAF-NRS Effect −0.59, 95% CI –1.11 to -0.06), BRAF Multidimensional Questionnaire (MDQ) Total −3.42 (95% CI –6.44 to -0.39), Living with Fatigue −1.19 (95% CI –2.17 to -0.21), Emotional Fatigue −0.91 (95% CI –1.58 to -0.23); RA Self-Efficacy (RASE, +3.05, 95% CI 0.43 to 5.66) (14 secondary outcomes unchanged). Effects persisted at 2 years: BRAF-NRS Effect −0.49 (95% CI −0.83 to -0.14), BRAF MDQ Total −2.98 (95% CI −5.39 to -0.57), Living with Fatigue −0.93 (95% CI −1.75 to -0.10), Emotional Fatigue −0.90 (95% CI −1.44, to -0.37); BRAF-NRS Coping +0.42 (95% CI 0.08 to 0.77) (relevance of fatigue impact improvement uncertain). RAFT satisfaction: 89% scored > 8/10 vs 54% controls rating usual care booklet (p<0.0001). Conclusion Multiple RA fatigue impacts can be improved for 2 years by rheumatology teams delivering a group programme using cognitive behavioural approaches. Fatigue in rheumatoid arthritis is common and cognitive behavioural therapy can help, but few rheumatology units have clinical psychologists to deliver it. This study demonstrates that rheumatology nurses and occupational therapists using cognitive behavioural approaches can reduce fatigue impact with both short-term and long-term effects. All seven clinical teams were able to deliver this intervention, suggesting future clinical implementation is feasible. Meta-analysis of psycho-educational interventions reporting RA fatigue also shows small-moderate benefit.10 However, only two specifically addressed RA fatigue.10 11 One intervention targeted distress, comprising 1–1 cognitive behavioural therapy (CBT), with an optional fatigue module.10 The second intervention aimed to reduced fatigue impact, using group CBT.11 Both improved fatigue/fatigue impact but were delivered by clinical psychologists, meaning they are hard to implement in the current NHS as few rheumatology teams include clinical psychologists.12 The aim of this trial was to see if usual care plus a group course delivered by rheumatology teams using cognitive-behavioural approaches (CBA) reduced RA fatigue impact more than usual care alone. The detailed methods have been published13 and a summary is provided here. UK, 7-centre randomised controlled trial of group CBA for fatigue self-management plus usual care (1–1 fatigue information) versus usual care alone. Eligible patients were aged >18 years with confirmed RA14 and fatigue severity >6/10 on a Numerical Rating Scale (NRS),15 which they considered recurrent or persistent. Exclusion criteria were recent changes to glucocorticoids (6 weeks) or major RA medication (16 weeks) or insufficient English to participate in group discussions. Patients were approached in clinic or by mailshots to departmental databases. Ethics approval was obtained (East of England Norfolk 13/EE/0310), the trial registered (ISRCTN52709998) and patients gave written informed consent. Usual care was the Arthritis Research UK fatigue self-management booklet, based on the original RAFT intervention,18 provided to and discussed with each patient for approximately 5 min by the research nurse at the baseline visit (ie, pre-randomisation). The primary outcome was fatigue impact at 26 weeks, collected by the central trial team by telephone using the Bristol RA Fatigue Numerical Rating Scale (BRAF-NRS Effect).15 Other fatigue elements were severity, coping (BRAF-NRSs) and overall impact (BRAF Multidimensional Questionnaire, BRAF-MDQ).15 Clinical status comprised pain (NRS), disability (Modified Health Assessment Questionnaire, MHAQ),19 sleep (item from Pittsburgh Sleep Quality Index),20 disease activity (DAS2821 at weeks 0 and 26, replaced at other time-points by self-report (sPDAS2),22 23 mood (Hospital Anxiety and Depression scale, HADS),24 quality of life (global question, Arthritis Impact Measurement Scale, AIMS)25 and leisure activities (discretionary activity subscale, Valued Life Activities, VLA).26 Self-efficacy and helplessness underpinning processes were assessed (RA Self-Efficacy scale (RASE), Arthritis Helplessness Index (AHI)).27 28 Outcomes were measured at weeks 0, 6, 26, 52, 78 and 104. At weeks 10 and 18, fatigue was measured for exploratory analysis of the week 14 consolidation session. Satisfaction with RAFT/booklet (26 weeks) and social contact (weeks 52, 104) comprised unvalidated questions. Economic and qualitative evaluations will be reported elsewhere. Seven centres each recruited four trial cohorts over 2 years. Once a centre recruited 10–16 participants (cohort), informed consent and baseline assessments were conducted. Computer-generated randomisation for that cohort was performed by the Bristol Randomised Trials Collaboration; thus, randomisation was stratified by centre, and within centres by cohort (1-4). Allocation was 1:1 with the RAFT arm receiving the additional patient if numbers were uneven. Patients randomised to RAFT but unable to attend their course were offered subsequent courses. All patients eligible at screening were accepted, even if they had become ineligible by baseline (medication/fatigue changes) while awaiting full cohort recruitment, mirroring the pragmatic nature of chronic illness interventions. RAFT group courses meant blinding of patients and clinicians was impossible, but data were analysed blind to arm allocation. Analysis followed a predefined plan, used STATA V.14.1.1, reported using CONSORT guidelines.30 Analyses were conducted on an intention-to-treat (ITT) basis without imputation of missing data, adjusting for baseline value and centre. Primary effectiveness analysis used linear regression to estimate an adjusted mean difference comparing fatigue impact at 26 weeks (primary outcome) between groups as randomised. Analysis was repeated including 20 sets of imputed missing primary outcome data. The multiple imputation model included all variables that were part of the ITT primary analysis, variables potentially related to fatigue impact (fatigue severity, pain, self-rated and nurse-rated disease activity) and baseline variables that were associated with missingness of the primary outcome. Secondary analysis compared groups across 26, 52, 78 and 104 weeks using a mixed effects model (treatment arm baseline measure of the outcome, centre and timepoint as fixed effects and participant as a random effect to account for the repeated measures nature of the data). Further secondary analyses of the primary outcome included: restricting the analysis to baseline-eligible participants (ie, fatigue severity >6/10); a Complier Average Causal Effect (CACE) analysis to investigate the efficacy of the intervention (based on treatment compliance status) for comparison with the ITT estimate of the offer of the intervention31 and investigation of potential clustering by centre and group. Secondary outcomes at 26 weeks were examined using linear regression for continuous outcomes and logistic regression for binary outcomes (adjusted for baseline measure of the outcome and centre) and over 26, 52, 78 and 104 weeks using the mixed effects models above. Potential predictors of fatigue impact change were modelled using stepwise deletion. Exploratory analyses assessed the effects of a potential tutor learning curve, the week 14 consolidation session and individual self-efficacy (RASE) questions at 26 weeks (t-test). Patient partners (Rooke, Robinson) brought experiential knowledge of RA fatigue and received the original CBT intervention.11 They advised on outcomes, questionnaires, handouts, recruitment and supported tutor training; Rooke provided advice on the tutor manual, attended project meetings and interpreted results. Four consecutive cohorts of 9–16 patients were randomised in each of 7 centres over 2 years (n=333) (figure 1), with similar numbers across centres (see online supplementary data). Six of 158 patients randomised to usual care alone withdrew before week 26. While 6 of 175 patients randomised to RAFT attended a later course than planned (with fresh baseline data), 14 patients could not meet any local course dates and did not receive RAFT. Of the 161 patients who received RAFT, 4 withdrew for personal/health reasons (having attended 1–3 of the 7 sessions) and 1 before week 10. Therefore 156/175 RAFT patients (89.9%) and 152/158 control patients (96.0%) provided primary week 26 outcome data; 153/175 RAFT and 147/158 control patients provided week 104 data (87.4%, 93.0%). Participant flowchart. CBT, cognitive behavioural therapy. All 7 rheumatology centres provided at least two clinicians and of 15 trained, 14 went on to deliver RAFT: 4 nurse/occupational therapist pairs, 1 occupational therapist pair and 2 nurse pairs. Tutors had been qualified for a mean 18 years (6–30), with 5.3 years rheumatology experience (0–17); 10 had experience of group work, of whom 4 reported knowledge of goal-setting or CBT. All hospitals delivered four RAFT courses. Tutor pairs remained unchanged, apart from one centre where tutor absence was covered by the remaining tutor codelivering one course with a trainer and one with a colleague who had previously observed. Seven of the 196 RAFT sessions (28 courses of 7 sessions) were delivered by a single tutor due to absence (3.6%). Independent monitoring of two sessions of every course confirmed tutor fidelity to RAFT content, delivery and CB principles. At randomisation, RAFT groups averaged six patients (5-8). Patients attended a mean 5.85 of their 7 RAFT sessions (SD 1.63), with 136 (87.2%) attending 5–7. All 156 RAFT patients attended their Session 1 (definition of having received RAFT), and each of the individual Sessions 2–7 was attended by >75% randomised patients. No related adverse events reported. Total 308/333 randomised patients completed primary 26 week outcome data. Baseline characteristics were similar between arms, being primarily female (RAFT 125/156, 80.1%, control 121/152, 79.6%), >60 years old (RAFT median 63.7, IQR 54.2, 69.9; control 61.8, IQR 54.4, 69.6) and a median 10 year disease duration (RAFT IQR 5, 19; control 3, 20). Baseline clinical data were similar between arms (table 1) with high fatigue impact (mean BRAF-NRS Effect >7/10) that was slightly higher than fatigue severity, low perceived ability to cope with fatigue, relatively high baseline disease activity (mean DAS28>4.2), moderate pain, low disability, moderate self-efficacy and helplessness. The 25 patients who withdrew had similar characteristics (see online supplementary data). During the trial, normal clinical management meant patients had changes to major RA medications but this was not different between arms (see online supplementary data). At week 26, mean BRAF-NRS impact was reduced by 1.36 units (p<0.001) in RAFT compared with 0.88 in controls (p<0.004).32 33 Regression analysis showed a difference between changes in fatigue impact NRS of −0.59 in favour of RAFT (p=0.03, table 2), giving a standardised effect size of 0.36 (adjusted difference in mean/pooled baseline SD). The primary analysis was repeated excluding patients who had fallen below the BRAF-NRS Severity>6/10 eligibility criterion between screening and baseline (23/156 RAFT, 23/152 control). For baseline-eligible patients, a larger effect was seen in favour of RAFT, with an adjusted mean difference between arms for fatigue impact of −0.82 (95% CI −1.40 to -0.24, p=0.01). Analysis on 20 sets of imputed data gave almost identical results (adjusted mean difference between arms for fatigue impact −0.58), therefore no further imputation was used. CACE analysis supported the finding of a larger effect from RAFT in those who ‘complied’ with the intervention compared with the ITT estimate of the ‘offer’ of the intervention (CACE treatment effect estimate −0.69). However, CACE methods could be deemed inappropriate as 14 patients randomised to but not attending RAFT had no follow-up data (see online supplementary data). No evidence of clustering was demonstrated: log-likelihood of linear mixed model −696.44 vs log-likelihood of model not adjusting for clustering −696.48 (p=0.96). Difference between the arms for fatigue impact was maintained over 2 years (figure 2). RAFT patients had a BRAF-NRS Impact score that was on average better than controls over 2 years with an adjusted mean difference of −0.49 (95% CI −0.83 to -0.14, p=0.01) (see online supplementary data). The mixed effects model conducted on baseline-eligible patients again showed a slightly larger treatment effect with an average adjusted mean difference over 2 years of −0.58 (95% CI −0.95 to -0.22, p=0.002). BRAF-NRS Impact scores (0–10) over weeks 0–104 by trial arm. BRAF-NRS, Bristol RA Fatigue Numerical Rating Scale. There was a difference between arms at 26 weeks in favour of RAFT for overall fatigue impact, emotional fatigue, living with fatigue (BRAF-MDQ Overall and subscales) and self-efficacy (RASE) (table 3). Findings were similar over 2 years, when better outcomes for fatigue coping (BRAF-NRS Coping) also emerged for RAFT whereas self-efficacy was no longer significant (table 4). There was no difference between arms for the other 13 secondary outcomes, including fatigue severity (tables 3 and 4). At 26 weeks, 89% of RAFT patients (133/150) rated course satisfaction >8/10 compared with 54% (75/139) controls rating booklet satisfaction (p<0.0001). Additionally, 96% of RAFT patients (144/150) were very likely to recommend it to others (scoring >8/10) compared with 68% (95/139) controls recommending the booklet (p<0.001). At 52 weeks, 20% of RAFT patients (n=35) had made further contact with their RAFT group, and 9% (16) at 104 weeks. The final linear regression model suggested worse outcome at 26 weeks was predicted by being female (0.75 unit increase in BRAF-NRS Effect, 95% CI 0.08 to 1.41, p=0.03) and higher baseline disease activity (1 unit increase in baseline DAS28 associated with 0.25 unit increase in BRAF-NRS Effect, 95% CI 0.02 to 0.49, p=0.04). Exploratory analyses (see online supplementary data): The difference between arms in mean fatigue impact change was smallest in cohort 1 (−0.37 BRAF-NRS Effect) and greatest in cohort 4 (−0.82), suggesting possible tutor learning over time (the study was not powered to test this). The adjusted mean differences between arms for fatigue impact, coping with fatigue and emotional fatigue were greater at week 18 than week 10, suggesting benefit from the week 14 consolidation session, but could reflect random variation over time. RASE addresses self-efficacy for RA self-management, and six RASE items demonstrated a difference between arms for change in favour of RAFT at week 26: relaxation, pacing, accepting fatigue, asking for help, using relaxation tapes and avoiding things that cause pain. RAFT, a seven-session group CBA course for RA fatigue self-management delivered by rheumatology nurses and occupational therapists, reduced fatigue impact beyond usual care both at 6 months and 2 years. RAFT had high patient attendance and satisfaction. Improvements were also seen in emotional fatigue, living with fatigue, coping with fatigue and self-efficacy. Improvements in fatigue impact demonstrated in usual care alone were not seen in the previous RCT, where the control was one general self-management group session of didactic information.11 The usual care fatigue booklet18 in this RCT was written by the team following the original RCT.12 A qualitative study suggested that patients felt the booklet made them feel more responsible for taking actions to manage their fatigue.34 The brief booklet discussion with the nurse in this RCT may have had a greater effect than a patient picking up a booklet in clinic. The amount of fatigue impact change that might be clinically important for people with RA is unknown. The minimal clinically important difference (MCID) for RA fatigue severity scales averages 10%,35–37 while multiple sclerosis fatigue impact MCID is 15%.38 39 RAFTs demonstrated 19% change in fatigue impact and usual care 12% (–1.36, –0.88 units) are thus probably clinically meaningful. The 2-year effects of RAFT on fatigue coping suggest that patients’ newly acquired fatigue self-management skills became embedded. Core self-management skills taught in CB approaches may have translated into improved coping. Overall self-efficacy favoured RAFT at 26 weeks with changes in 6/28 RASE items of key fatigue self-management issues addressed in RAFT. Self-efficacy was no longer significant at 2 years, possibly reflecting the dominance of the 22 general RA self-management items in the RASE score over time since RAFT, compared with the focused fatigue coping NRS (ie, a measurement issue). The study’s external validity was strengthened by involving 7 hospitals, 14 tutors, broad entry criteria and strong patient and public involvement. The pragmatic trial design accommodated features of real clinical practice: natural variations in medication, fatigue, group size, session attendance and tutor availability. Collection of the primary outcome by telephone gave high return rates. There was no control for social effects of RAFT groups: seven sessions of didactic information would not reflect usual care and likely incur high attrition. In the original RCT, patients reported benefit from interactions with other patients, but considered tutors more important, otherwise patients would have ‘pulled one another down’.44 Delay between screening and baseline assessment was inevitable while building cohorts for randomisation, and some patients no longer had eligible fatigue severity scores at baseline. However, RAFT still had an overall treatment effect, with a greater effect in baseline-eligible participants. Delays would be shorter in clinical practice as only sufficient patients for a RAFT group need be recruited. Six RAFT patients requested a later course and had a fresh baseline assessment, collected after randomisation. Major medication changes might influence fatigue but changes were not different between arms and remission through optimal medication does not resolve problematic fatigue.45 We did not collect follow-up data on 25 patients who withdrew, but imputing missing data did not change the primary outcome analysis. RAFT patients were not asked to rate the usual care booklet. Codelivery by a rheumatology professional and a patient (bringing experiential knowledge of RA fatigue) could be evaluated,46 as could delivery in physical long-term conditions with fatigue (multiple sclerosis, Parkinson’s disease) and the MCID for the BRAF-NRS Effect established. 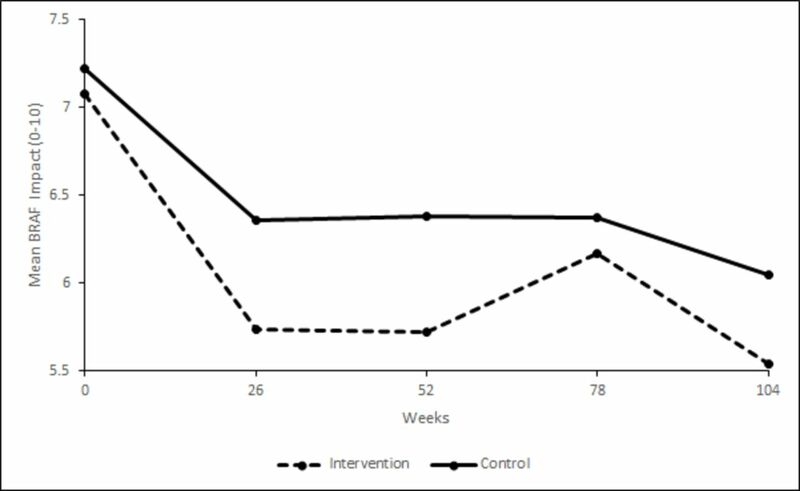 The CBA intervention was delivered by clinical rheumatology nurses and occupational therapists, addressing the lack of rheumatology psychologists.12 Similar success has been demonstrated in multiple sclerosis fatigue.47 RAFT delivery by clinical teams was feasible: all planned RAFT courses were delivered, tutor absence was managed and patient attendance high. 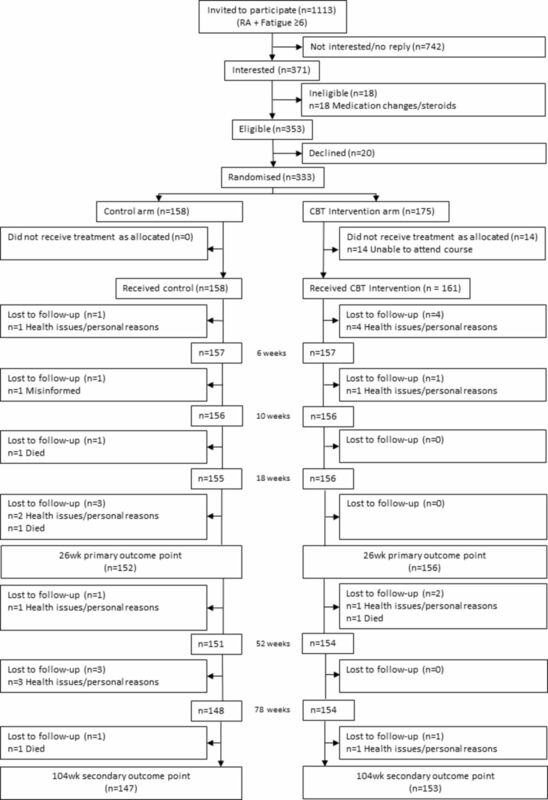 Increasing group size to 8–10 patients would be feasible, as would including patients with other inflammatory rheumatic diseases and fatigue.48 49 Several RCT centres now deliver RAFT clinically. We would like to thank the 14 RAFT tutors, the research nurses in the 7 participating hospitals and the patients for their participation. This study was designed and delivered in collaboration with the Bristol Randomised Trials Collaboration (BRTC), a UKCRC Registered Clinical Trials Unit which, as part of the Bristol Trials Centre, is in receipt of National Institute for Health Research CTU support funding.
. Fatigue as experienced by patients with rheumatoid arthritis. Int J Nurs Stud 2008;45:995–1002. , 2016. Biologic interventions for fatigue in rheumatoid arthritis (systematic review). Cochrane systematic reviews. Available: https://www.cochranelibrary.com/cdsr/ [Accessed 5 Sep 2018].
. Guided discovery: using the Socratic method. In: Sage N, Sowden M, Chorlton E, eds. Cognitive Behaviour Therapy for Chronic Illness and Palliative Care. Chichester: Wiley, 2008: 66–77. , 2011. Arthritis Research UK. self-help and daily living: fatigue and arthritis. Available: www.arthritisresearchuk.org/~/media/Files/Arthritis-information/Living-with-arthritis/2269-Fatigue-and-Arthritis-inc-excercise-book.ashx [Accessed 11 May 2018].
. The Pittsburgh sleep quality index. Psychiatry Res 1989;28:193–213.
. Development of a disease activity score based on judgement in clinical practice by rheumatologists. J Rheumatol 1993;20:579–81.
. Measuring health status in arthritis: the arthritis impact measurement scales. Arthritis Rheum 1980;23:2:146–52.
. Factor structure of arthritis helplessness index. J Rheumatol 1988;15:427–32. , 2018. (consolidating standards of reporting trials) statement, checklist and flowchart. Available: www.consort-statement.org [Accessed 10 Apr 2018].
. Reducing arthritis fatigue – clinical teams (raft) using cognitive behavioural approaches: an RCT. Ann Rheum Dis 2017;76110.
. Reducing arthritis fatigue – clinical teams (raft) using cognitive behavioural approaches: an RCT. Rheumatology 2018;57:key075.180.
. Determining the minimal clinically important differences in activity, fatigue, and sleep quality in patients with rheumatoid arthritis. J Rheumatol 2007;34:280–9.
. Determination of the minimal clinically important difference for seven fatigue measures in rheumatoid arthritis. J Clin Epidemiol 2008;61:705–13. Collaborators The RAFT study group: In addition to the listed authors, this comprises P Creamer and R Hughes (local PIs throughout), B Knops and R Cheston (intervention training and monitoring). The authors would like thank the following for their collaboration: S Green, S Webber, P Thompson, N Viner, K Mackay (local PIs); F Robinson (patient research partner) and D Carmichael (database and randomisation services, Bristol Randomised Trial Collaboration). Contributors SH is the chief investigator responsible for the trial, led the study team, supervised the conduct of the trial, analysis and reporting and drafted the manuscript. SH, NA and JP jointly conceived the original idea and led on the trial design and protocol. PSB, WH, EHC, JRK and ED contributed to trial design. NA, SH, ED, BK and AH developed the RAFT intervention materials and delivered the tutor training and RC monitored programme delivery (quality assurance). PSB, WH, JT, BK, NT and JP led on the statistical design and analysis, including health economics. ZP, CA and CR, along with all other authors, contributed to methods of data collection, patient materials and data management. ZP managed the trial with CA, including research governance, data collection, data entry and validation. DC was responsible for randomisation. JRK, PC, EHC, NV, KM, SG, SW, PT and RH led recruitment at the 7 centres. All authors reviewed, discussed and helped interpret the findings, commented on and approved the final version of the manuscript. Funding This research was funded by a National Institutes for Health Research Health Technology Award: 11/112/01. Disclaimer The views expressed in this paper are those of the authors and not necessarily those of the NHS, the National Institute for Health Research or the Department of Health. Data sharing statement Results from the health economics and qualitative evaluations will be published as two further papers.